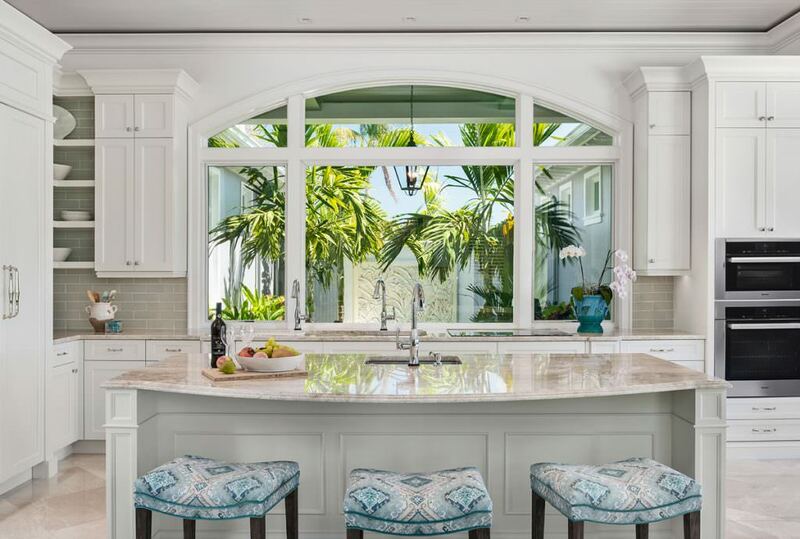 Harwick Homes has completed a 10,799 square foot private residence in Marco Island. The two-story estate was designed by architect Jon Kukk of Kukk Architecture. Interior design was completed by a team at Jinx McDonald Interior Design, composed of Chrissy Howard and Barbara Schwenk. Christian Andrea of Architectural Land Design executed the civil engineering of the project and Brad McKinzie of Custom Lawn Creations handled landscape planting and installation. This palatial estate is appointed with three bedrooms and four and a half bathrooms. Entering the home is an adventure in itself, as the residence is nestled at the end of a gated, winding driveway with plenty of landscaping to conceal its true magnificence until guests arrive at the front door. The front of this traditional tropical estate features large brackets, decorative railings, and elaborate shutters. 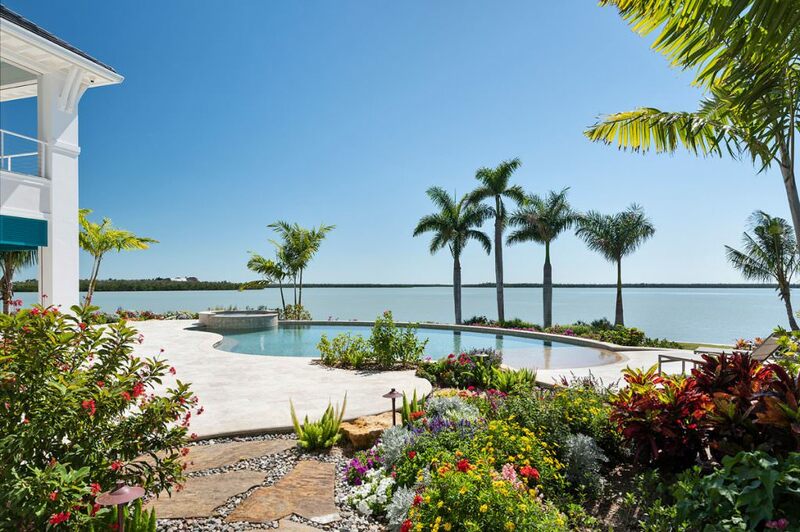 This home is situated on the southernmost point of Marco Island, with nothing beyond the home except Caxambas Bay and the Ten Thousand Islands. The homeowner aspired to pay homage to the native Calusa Indians in the interior design, resulting in native textures and sophisticated functional features being implemented throughout the home. The tribal and organic flair to this estate is unique for coastal cottages, and proves to work incredible well. 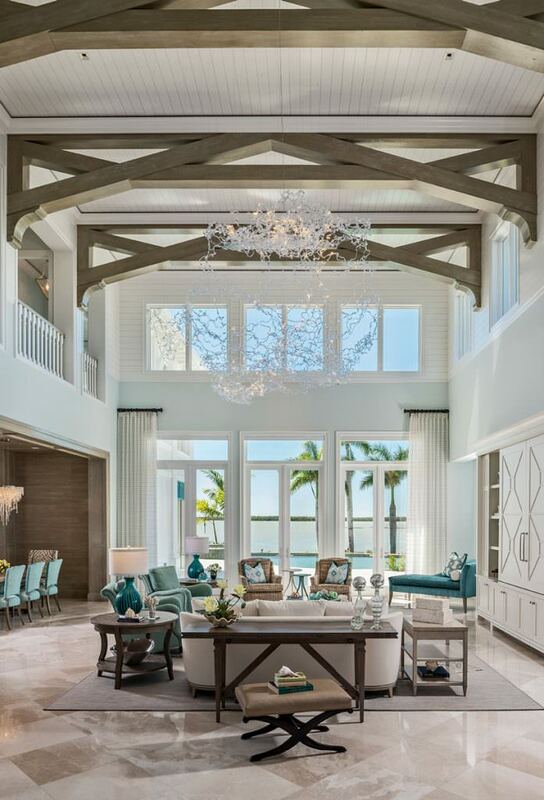 Upon entering the front door of the Marco Island residence, guests are welcomed from the driveway up a coral stone runway leading directly to the expansive two-story entryway. An intricately designed spider web balcony sits atop the dark wood double-door entrance, framed with four white pillars clad with rafter tails. Guests are welcomed into the great room, which hosts the baby grand piano and offers immediate views out to the patio, infinity pool, and water beyond through floor to ceiling windows. “This custom-built residence epitomizes Florida living. Our team took full advantage of the incredible lot when building the home, knowing that we wanted to prioritize outdoor living and views. With unparalleled and unobstructed views to the water, this home is a Floridian dream,” says President of Harwick Homes, Mark Smith. Unique interior features include a studio with views to the interior courtyard. The primary motivation for creating the interior courtyard was to offer an aesthetically pleasing view for the window-less rooms in the home. The studio being one of these, now has a beautiful window offering views to the immaculately landscaped courtyard. An intricate LED light chandelier resembling a ‘cast net catching stars’ is suspended above the great room – an incredibly unique design choice made by Jinx McDonald. “What we love about this chandelier and the home in general is that every angle offers a different perspective,” says Chrissy Howard of Jinx McDonald Interior Design. The LED lights are embedded within a polycarbonate resin, and create a completely unique astrological effect both when it is illuminated and off. The lower level great room offers access to the second floor by a staircase with wood treads and white risers located directly to the right of the entryway. The staircase leads guests up to an open walkway directly over the front door entrance that overlooks the lower level great room to the right, and to the left offers direct access to the front-facing balcony. The upper level of the great room is activated with clearstory windows. The ceiling boasts exposed stained wood trusses, adding volume and proportion to the spacious great room plan. The kitchen, dining room, and family room are all connected by the open floor plan. All boast turquoise accents, and the dining room host and hostess chairs are upholstered with a black and white animal print, another hint of tribal inspiration. A Swarovski crystal chandelier sits atop the dining room table; a welcome sparkle to break up the native textures. The dining room is surrounded by a driftwood ceiling and wall, serving to separate the room without using a physical barrier. The entire second story of the estate is dedicated to the master suite. Arriving either by elevator or staircase, the homeowner will reach their first stop into the second story master suite, which hosts a spacious private sitting room and utility space. After exiting the sitting area, the homeowner will continue to the exposed hallway toward the second access point, which opens directly to the master bathroom and closet spaces. The homeowner will enjoy spacious his and hers closets to the left and right sides of the suite. Directly upon entering this space, is a perfectly symmetrical view featuring a freestanding uniquely curved bathtub in front of a porcelain dual entry shower. A recycled glass porcelain mosaic decorates the porcelain wall above the bathtub. The two private bathrooms sit on either side of the shower entrances. In the southernmost point of the second story sits the master bedroom, which boasts pocketed sliding glass doors with an incredible view of the water. Every part of this room is custom-made, including the bed frame which presents a constellation pattern rather than a typical tufted backboard, further incorporating the astrological theme.